Edward Granlund of Westminster, Maryland shares his advice on travel and money. 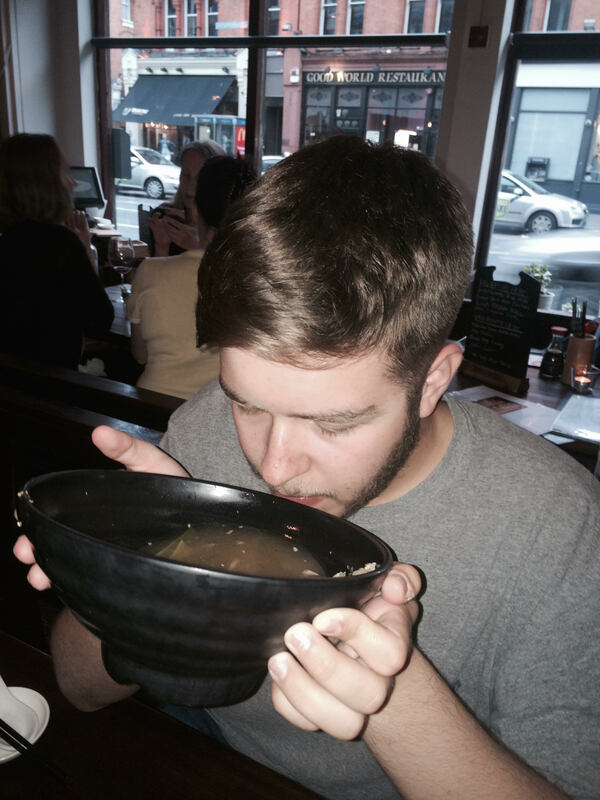 Edward Granlund (Westminster, Maryland) eating Ramen abroad in Dublin. In America, you don’t need to go far to find an ATM and grab some quick cash. And due to the international reach of most banks and credit institutions, taking out cash overseas isn’t that hard either. However, you should be aware that there are significant differences when using your debit and credit cards abroad as opposed to in the United States. Also, there a few steps that you should take before traveling internationally to minimize any setbacks to accessing your cash while you’re out of the country. Here are six of them. 1. Don’t assume overseas ATMs are the same as in the U.S.
Take note that ATMs overseas don’t necessarily have the have capabilities as the ones in the United States. You’ll find that most ATMs overseas are pretty limited, meaning that their primary function is to dispense. Don’t be surprised if you can’t transfer money or view your available balance while using certain ATMs. Also, if possible, to try to use ATMs during your bank or credit institution’s operating hours in case you need to reach out to them regarding an issue. You’ll find that most of today’s major banks offer both online banking as well as phone apps to help cardholders keep track of their account updates. Having these notifications can be crucial when you’re overseas as you can immediately get notified of any fraudulent activity or other issues regarding your account. If your card gets stolen and someone tries to use it, lowering your daily cash withdrawal limit can come in handy by reducing the amount that they can take out if they’re successful with using it. With credit-card and banking fraud on the rise, today’s banks are continually fighting to protect cardholders. Making a call to your bank to have them note your account with your trip location and dates is a great way to prevent any issues with using your card while overseas. After all, the last thing you need when overseas is an issue accessing your cash. If you need cash while you’re traveling overseas, it’s better if you use your debit card instead of your credit card. The latter not only tacks on interest unnecessarily, but the fees also are usually higher versus your debit card. Also, don’t forget the ATM transaction fees. It’s always a good idea to keep a certain amount of cash on you to take care of your daily expenses for a day or two in case you encounter problems with your bank or when using an ATM. Keeping a couple of hundred dollars in your hotel safe can enable you to pay for food and local travel while you sort out your ATM issues. Traveling overseas can bring about several challenges for new and experienced travelers. Knowing how you’ll access and manage your cash while abroad can save you time and frustration. About the Author, Edward Granlund of Westminster, Maryland: Edward Granlund’s most recent endeavor is the Capstone Project offered by the CyberSecurity program at Carroll Community College. He is currently involved in an intensive program focused on building a prototype for advanced cyber defenses. Despite living in the digital age, Edward Granlund still has a sincere appreciation for meaningful conversations and enjoys building relationships with others. Edward Grandlund is self-described technology buff, who has spent the last year attending Carroll Community College where he is learning the tools and systems used to monitor, mitigate, and prevent online threats. Edward Granlund is committed to earning a Bachelor’s degree in Cyber Security. He As a professional, Granlund’s goal is to combat hackers, cyber terrorists and other technical problems that could comprise network security.